All Men of Genius by Lev AC Rosen. Grades 9+ [adult, with high crossover appeal]. Tor, September 2011. 462 pages. Review copy provided by my local library. Scientific genius Violet Adams wants nothing more than admission to Illyria College, Victorian London's most prestigious science academy. The problem? They don't admit women. So Violet disguises herself as her twin brother Ashton and gains admission, but it won't be easy to keep her secret while fending off advances from the Duke of Illyria's young cousin and dodging killer automata in the labyrinthine basement. The character of Violet Adams drew me into this story and I thoroughly enjoyed the time I spent with her. At 17, Violet longs to be taken seriously. She wants scientific debate, not pretty flowers. She wants to test out her inventions, not to test out different hairstyles. And whenever Violet feels like someone's not taking her seriously, she gets seriously offended. She's feisty and she's smart and she's brave, but she's not perfect - certain people see through her disguise with laughable ease and she lets her own indignation get the better of her sometimes. In addition to Violet, Lev Rosen introduces us to a diverse, well-developed group of supporting characters. Violet's school gang is extremely entertaining, from Jack's experiments on ferrets to Toby's constant quest for a hangover cure (which, of course, requires much consumption at their favorite pub in order to test his prototypes). The reader also gets occasional glimpses into the lives of the Illyria professors and other characters (even a cameo from Dr. Jekyll...). The tone of the book is light with plenty of humor and some romance woven in among the scientific experiments. The plot's pretty action-packed, including mysterious happenings in the basement of the school, a blackmailing student who somehow discovers more of the group's secrets than is ideal, and enough mad science to fill a school full of laboratories. There's a lot going on and it mostly works, though I think the writing could have been a little bit tighter. I found my interest lagging a tiny bit towards the end, even as the action barreled forward in madcap fashion. However, overall, I really enjoyed this novel and I hope there's more to come from Mr. Rosen. 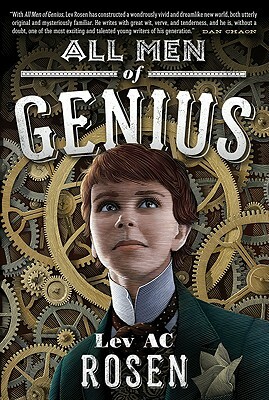 All Men of Genius is published for adults, but I think it's going to have high crossover appeal with teens who enjoy steampunk. I'd hand it to fans of Phillip Pullman's His Dark Materials, Scott Westerfeld's Leviathan, or Tamora Pierce's Song of the Lioness quartet. I picked up this book because of Ana and Thea's glowing review over at The Book Smugglers, so make sure you check out their review as well. You also may be interested in Lev Rosen's guest post on queer characters in steampunk over at The Story Siren. All Men of Genius is on shelves now!